In searching for a simple way to explain the unpredictable path that an individual social media update can take once it is put out into the online world, one real-world comparative situation stood out: The life of a ‘beach ball’. I had used this comparison example a couple of times in presentations, but it seemed to hit-home strongest when I introduced a physical beach-ball into a recent fun and interactive social media education session with a group of approximately 130 Year 7 high school students. Summer in Australia means cricket. Big crowds at big stadiums, enjoying the match, soaking up the sun, passionately cheering and supporting their team. There is colour, excitement, Zinc cream, the Mexican Wave, and more often than not, a beach ball or two. 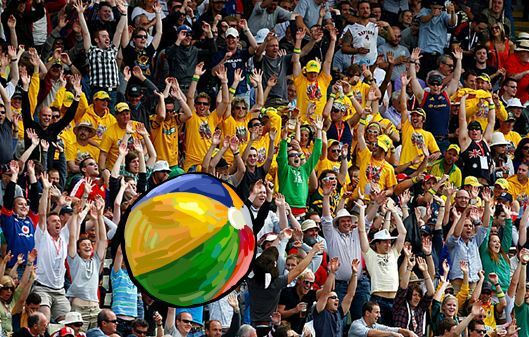 What happens when someone brings a beach ball to a sporting event, like the cricket, or a concert? The owner blows it up, before sending it from their seat, out into the crowd of thousands. Then just like that it’s gone. What happens to the ball next is out of the owners control. Which way it goes, how many people see it, touch it, and where it ends up… they have little-to-no say. As it floats away, more and more people, strangers, put their hands on it, and hit it along, trying to keep it alive for as long as possible. But they too, have little-to-no control over where it lands, or who touches it next. The whole time the colourful blur is bouncing and floating around the crowd, all-eyes are fixed on the ball wondering where it will go next, and readying themselves for a chance to get their piece of the action if it comes into their section. Now picture the beach ball is a single social media update. A tweet, Facebook post, Instagram image, or Youtube video, being sent out into the crowded digital world. Like the ball, once you send or share that post on a social media platform, you the owner loses all control over its final destination. Sure you can have a general idea who the main audience for your update will be, your friends and followers, but like the ball, it’s easy for someone from your ‘crowd’ of followers to rocket that post off to another section of the digital world, unknown to you. Once it is out there, you lose control over the audience or crowd that can see and interact with that update. Whether they are sharing, re-tweeting, tagging, commenting on, liking, or forwarding, they can tap that ball around however they like, to whoever they like. It’s also important to remember that with each hand that touches the beach ball, or interacts with the social media post, the crowd that can see it up close and personal grows larger and larger, ensuring it’s seen by more and more people. And as we know, it’s never just those that touch the ball (or interact with the post) that have seen it. The crowd (or audience) for a social media update is just like the crowded stadium at the cricket. The update could be seen by many more people than you can imagine. 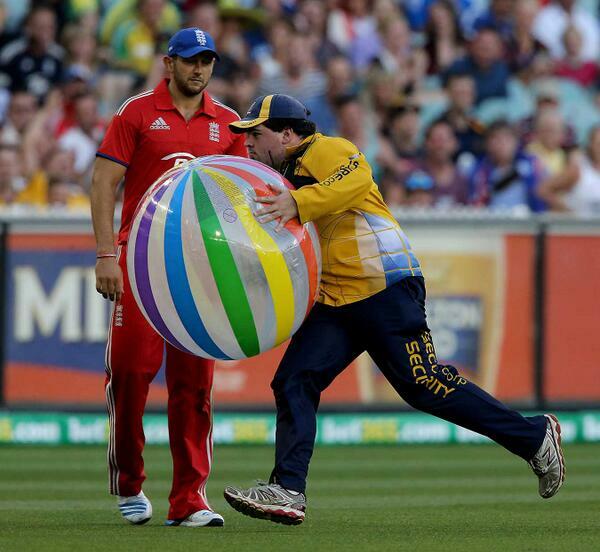 Invariably, it doesn’t end well for the beach ball. Eventually it will be gathered up, plucked and then burst by a member of the crowd, security or other authorities. This is often times a similar outcome to rogue, social media updates sent out by individuals. If they are not thought through, are inappropriate, or generally negative in their message, they can end up in the hands of parents, coaches, principals, employers, and even authorities themselves. This message formed part of a recent Hook Media social media high school presentation to Year 7 students. Read more about that interactive session here.